Kauffman Center, we strongly encourage you to arrive early to ensure you have a parking space for your performance. Parking is now available for the 1,000-car Arts District Parking Garage, adjacent to the new Kauffman Center for the Performing Arts. This all-new parking structure offers convenience and shelter from inclement weather. Parking is safe and affordable. Parking is $10 at each event and season subscribers can purchase parking vouchers in advance. Charging Stations for Electric Cars are available in the Garage on Level three, located on the North Wall of the Garage, west (Left as you face the KCPA), of the entrance to the Garage Elevator Lobby. Accessible parking is available on a first come, first serve basis. We advise patrons needing an accessible parking space to arrive early. Valet parking is available for $18 in advance, or $20 at the performance. Valet service offered for most performances. Call the box office for availability. For your convenience, the drop-off lane is located on the south side of the Kauffman Center, accessed from Broadway. Order in advance online or call the Symphony Box Office at (816) 471-0400. 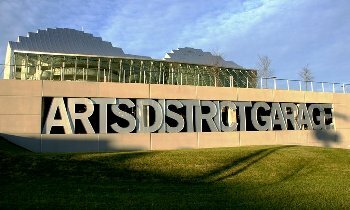 In the Crossroads District, where the Kauffman Center for the Performing Arts is located, there are numerous surface parking lots available for Symphony events. Numerous parking spaces are available throughout the Crossroads District, including free parking along Central, Wyandotte and Baltimore Streets, plus 17th, 18th and 19th Streets. There is also available parking for purchase in the new Webster Garage. Available street parking and surface lots are highlighted in yellow. Due to ongoing construction downtown, traffic flow on Wyandotte, Baltimore, 15th (Truman Road) and 16th street will be impacted through 2020. Enjoy the same world-class service all our guest artists receive from our official ground transportation partner: LEADER Worldwide Chauffeur Services. Choose from a variety of special roundtrip or charter packages in your choice of Luxury Sedan, SUV, Passenger Van or Stretch Limousines for an easy, convenient, worry-free evening. Call (816) 753-5323 or go to LEADERWorldwide.com to reserve your trip today.